A few months ago I wrote a pair of posts about setting up a minimalist kitchen: things to avoid and the essentials ( and the nice-to-haves). Following on from this, I thought I’d have a crack at pulling together a list of the essentials and the nice-to-haves for stocking a minimalist pantry. I’ve actually been thinking about this post since I was in Barcelona last year. Living there for 6 weeks with a tiny kitchen, I really enjoyed the exercise of keeping my pantry items to a minimum. Back at home it’s time for a long overdue pantry clean out. ‘The lentil shuffle’, as St Nigel calls it although mine is more like ‘a random sauce exorcism’. So for fun I’ve also included a list of the very unminimalist things I’ve ditched (or am using up and not planning to replenish). And for the record, I’m planning to tackle the mess that is my spice box another day – watch this space. Again, this is just my personal list – based on the types of things I like to cook. Of course your essentials will be different depending on your cooking preferences and style. Actually I’d love to hear if there’s anything you strongly disagree with or anything you feel it is a crime not to include. In Spain I went with a good quality but not too expensive olive oil, which I used for both cooking and making salad dressings. At home I think a minimalist pantry can stretch to a cheaper extra virgin olive oil for general cooking, a more expensive peppery number for dressings and drizzling and some peanut oil for high temperature frying, stir frying or roasting or whenever you need a neutral flavoured oil (like mayo). Again in Spain I had just one box of sea salt flakes but for a more permanent kitchen I’d also allow a cheaper grade of sea salt for making brines and salting pasta water – the times it would be cost prohibitive to use my Maldon. I can’t imagine a world without freshly ground black pepper. So much so that I’ve been known to travel with my favourite pepper grinder. Caster sugar is the most versatile as it is fine grained so will dissolve readily. If you’re not a baker, you could probably get by without sugar. In that case I’d include honey for whenever a little sweetness is needed – like in salad dressings or to balance out the seasoning on something overly salty. In Spain I limited myself to one vinegar, which of course was a lovely aged sherry vinegar. I didn’t miss my massive vinegar collection, well not too much anyway. Of all the sauces, soy is the most versatile. I’ve been appreciating it as a vegetarian source of savoury flavours. It was the secret ingredient in my recently posted carrot soup. At the moment I have a bottle of Tamari, a wheat-free soy sauce which is handy for when I’m cooking for my gluten-intolerant Dad. While it isn’t very minimalist to have four different bars of dark chocolate on hand, I have no hesitation including it in the essentials list. You never know when a chocolate-critical moment is going to arise. Also great to have to offer for dessert when you haven’t prepared something for your guests. I love my tea and couldn’t imagine life without my super strong Barry’s Irish Breakfast in the mornings, my Chinese Pu Mu Tan White Tea to sip while I write, and my Lemongrass and Ginger for a caffeine-free after dinner treat. Just need to work my way through my excess Jasmin tea collection. Ever since I was a uni student I’ve always felt I could prepare a meal if there was some pasta and a tin of tomatoes in the cupboard. Also great to add richness to stews and soups. If I had to narrow down my canned legume collection to one essential, chickpeas would win hands down. A meal in a can really (see warm salad recipe below) and an excellent source of protein and iron. Also known as ‘Puy’ lentils, these are my favourite lentil. Small and pretty, they are very forgiving and don’t turn to mush like many other lentils. It’s not called ‘all purpose’ flour for nothing. Can be used in baking, breadmaking and pasta. Not essential for non-bakers, but my first choice for a leavening agent. Will turn plain flour into self raising flour in a flash – just add 2 teaspoons to a cup of plain flour. I know I said I’d leave my spice box for another day, but dried red chilli flakes are my first choice for adding a little fire. For crunch in a crumble, or salad, or for a healthy snack, it’s always a good to have some nuts on hand. I usually have almonds and pinenuts but pistachios, hazelnuts and maccadamias make an appearance from time to time. I tend to have at least one short pasta like my current favourite, mezze rigatoni and a long pasta like linguine in the pantry. Worth spending the extra money on the artisanal stuff. As anyone with an Irish boyfriend knows, potatoes are an essential pantry item. I don’t think we really need to have four different varieties in the larder all the time, but who’s counting? It keeps for ages and makes a world of difference to many dishes. I have this thing that if I have lemons and parmesan (and loo paper) in the house then everything will be all right. Surely the most versatile and long lasting cheese. There are few things that can’t be improved with a little grating of fresh parmigiano reggiano. I also love it as a snack. Critical for roast spuds, and easy to grow. It’s one of my few surviving fresh herbs. Also keeps well in the freezer if you aren’t lucky enough to have a fresh source. If it wasn’t rosemary, thyme would be my second fresh herb choice. If you have eggs, you have a meal. I always have some in the fridge and find they tend to last well beyond their use-by date. I love brown sugar for sprinkle on my porridge or for baking. Can be substituted for palm sugar in Asian cooking. I’ve already confessed to having a massive vinegar collection which will be hard to part with, but I think I can do it if I keep a well-aged balsamic, a light white wine vinegar, and my Sarsons brown malt vinegar that I picked up in Ireland to splash over takeaway fish and chips. A little goes a long way but there’s nothing like a splash of sesame oil to round out Asian dishes. I love a little drizzled over steamed greens and steamed whole fish. After soy, these two are my go-to sauces for Asian cooking. If I have these on hand I can make do without hoisin, black bean, sweet soy etc. Of course this is a real personal preference thing. These fall under the category of ‘sentimental ingredients’. I like to have both on hand in case I get a craving for my Mum’s chocolate caramel slice. Appreciate that they wouldn’t star in most people’s nice-to-have collection. In my mind these two little bursts of saltiness go together, although are not interchangable. They are both brilliant to brighten up your cooking. Anchovies also have the ability to enhance the meaty flavours in a lamb or beef stew. Another little ray of salty sunshine that can make a world of difference to your food. If chickpeas are the essential canned legume, it is nice to have some or all of the above on hand for almost instant salads or purees. Also known as bakers flour or high protein flour, this is the best for baking bread, pizza crusts or home made egg pasta. Of course, non-bakers can skip this. For adding texture to fresh pasta and giving pizza bases and bread a rustic crunchy base. For beefing up the fiber content in my breakfast. More on spices to come, but these are the three I rely on the most. Purists will argue that they should be whole seeds but minimalists will see the benefits of not needing another piece of equipment to grind their spices. For making puddle cookies and best ever (cocoa) brownies. Definitely not essential but good to have on hand for baking or for a hot chocolate when someone has depleted your chocolate stash. At the moment I have some dried sweetened cranberries that can be used in salads or baking. I do love dates and prunes as well but they tend not to be as versatile. Am tempted to put this in the essentials, but I did survive my 6 weeks in Spain without. Lovely with avocado on toast but I won’t try and convert any non-Australians, just yet. Sometimes, if I’m feeling a bit impoverished, I use vanilla extract instead. While pasta and rice are essentials, I do like to keep different grains on hand. Barley, freekah, couscous and quinoa are all in my pantry at the moment. So many great things start with sauteeing an onion. Sometimes I wish that chickpeas came in a smaller can. The problem with the standard size is that it’s not enough for 2 people but makes for a very large serving for one. I always have the best intentions with this salad but it’s so comforting and moreish that there are never any leftovers. Think of this as a base to play around with. I think it’s perfect as is but if you don’t have almonds, most other nuts would work. Or you could leave them out all together and serve the chickpeas with a sprinkling of finely grated parmesan instead. If you were in the mood for some greenery, a handful of salad leaves tossed through at the end wouldn’t go astray. Neither would a nice little side salad, but it is completely satisfying on it’s own. 1. Heat a medium frying pan over a medium high heat. Add 2 tablespoons extra virgin olive oil. 2. When the oil is hot add garlic, rosemary (if using), chilli and almonds and stir fry or a minute or so, until the garlic is just starting to brown. 3. Toss through drained chickpeas and continue to stir fry until chickpeas are warm and starting to brown up a little as well. Season generously & serve warm. more veg – toss in some salad leaves or parley at the end. Also you could soften an onion before cooking the garlic if you have more time. family-friendly – skip the chilli or serve Marcos chilli oil at the table for the adults. My boys like this better without the rosemary. paleo / low carb – replace chickpeas with roast veg. Cauliflower like this is really lovely. more substantial – toss in cooked pasta, cooked chicken or serve with a fried or poached egg. cheesey – fab with shaved or grated parmesan. different herbs – also lovely with thyme or sage. nut-free – replace almonds with shaved parmesan, crumbled feta or roast veg. 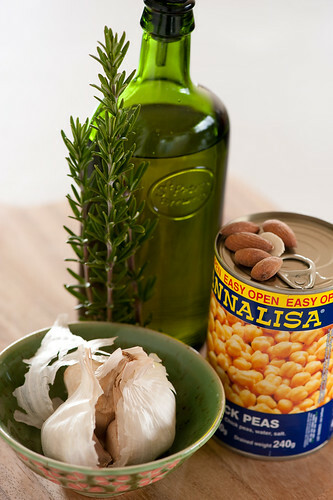 different legumes – any canned or cooked legumes such as white beans, cannellini beans or lentils. Great post. My essentials: eggs, cheese, and yoghurt. Feel nervous without them! Yoghurt is great for a quick and healthy dessert/breakfast, topped with honey, jam, toasted muesli, fresh fruit, and/or brown sugar. Also good as a topping for a baked potato with sweet chilli sauce… which is a good friend to a pork fillet and green beans! Don’t ditch the dried cherries. Add them to your next batch of cocoa brownies. The result is amazing! The minimalist way will be my way through summer 2010! Arrived here after following a link on twitter and I’m so glad I did: this is a wonderful, worthy post, and I’m off to tackle all the ludicrous items cluttering up my pantry asap. I need to do this list for my house – I have finally got my pantry sorted so I feel like I have more than enough space for my minimalist needs. But given that we have a vegetarian, a meat eater, and 2 kiddies our ‘must have’ list is a bit longer … including cream of tartar for home made playdough, sprinkles to turn anything into a ‘treat’, and marmite for the essential kiwi kids lunch! Being a foody its hard not to collect random things … just last week I found myself about to buy a bottle of toasted sesame oil. Having recently set up a second kitchen in a second home I’ve been able to just stock what I deem essential and it’s very satisfying to have just two shelves of ingredients, a few pots and pans and a minimal assortment of utensils. Your minimalist kitchen list helped me to cull my initial thoughts on what I needed. I’m pleased to say that I’m getting by quite well with not a lot of extra “stuff”, and I might add, only one bottle of vinegar (sherry)! I feel overwhelmed when I visit my other kitchen which is choc-full of food (7 vinegars) and kitchen paraphernalia! The minimalist kitchen might soon get rolled out there too…. I really identified with your list this time. However, balsamic is my essential vinegar, and vanilla bean paste and eggs are a pantry staple too. I love (LOVE!) chickpeas, so I’m chuffed to see them here. I might try this salad for my lunch tomorrow. Great list. Whilst I love the minimalist concept I just need to have all my random ingredients but I totally understand the frustration of having a pantry fully of useless things. I have wished many time that chick peas would come in smaller size tins as well. Maybe 10 years ago, a company in Colorado did make an 8 oz can (Kuner Vegetables), but they don’t any more. Perhaps we should write to them. Nice list. I am a salad dressing maker and really like having several different types of oils to include walnut, grape seed, and cold pressed olive oil (Genco is my favorite). If you buy the olive oil in a one gallon can it is much cheaper for the good stuff. The small bottles, 8 to 12 oz, of good olive oil can run $9 to $17 dollars here in the US, a gallon of Genco from Italy is $23. The one gallon lasts about a year for me (cooking for two), I use a smaller bottle by the stove to refill with a funnel, so I don’t have to try to get 3 Tbsp out of the large gallon tin. Love your 10 minute 5 ingredient and minimalist cooking. I have made several and it seems we enjoy the same foods. Wow, your essentials and nice-to-haves are almost exactly like mine – I knew I loved your blog for a reason! Minus the vegemite, and dried instead of canned beans, we’re on the same page. I have made the switch to dried beans and would heartily recommend it, Jules. There’s a technique for cooking beans that only requires 1 1/2 hours, almost entirely hands-off. Just put some dried beans in a pot, add water to cover by a couple of inches, bring that to a boil, add a bit of salt, then put the whole thing in the oven at 250 degrees farenheit for 1 to 1 1/2 hours, until they’re tender. So easy and I like the texture a lot. my essentials list is similar although i prefer apple cider vinegar if I have to choose and use canned black beans much more often than chickpeas. I would add cornmeal to the list, I admit I only use it for one thing, but I can’t live without cornbread! I also like to keep couscous and rice noodles on hand as well as some frozen veggies for those days when even pasta isn’t quick enough or I haven’t had time to go to the market. Finally, I don’t know if it counts as minimalist, but I have potted herbs (mint, basil, rosemary) growing on my windowsill. They jazz up my meals, smell good *and* look pretty and green in the city. I don’t write much about cooking, but I do write about simplifying life, so I find your minimalist pantry suggestions fascinating. I just discovered this blog a few days ago and love it already. You’re so right about the in between serving size from one can of chick peas. Despite the serving size issue, this looks like a fantastic one person, quick-dinner meal. Thanks for the recipe! Vegemite deserves to be an essential. It’s needed for a Sunday night supper of boiled eggs and vegemite soldiers. It’s a great hangover cure with its B vitamins. It can be used the way you’ve used the soy sauce in your carrot soup, to add a little salt and increase the depth of flavour. And even without all this, it’s so entertaining to watch overseas guests help themselves to it over breakfast! Ditch bi-carb soda??? It has 1001 uses and is one of those house-cleaning essentials! I use it to clean my stainless steel sink to a brilliant shine; any tarnished silver (line plugged sink with foil, place silver on top, pour boiling water over to cover, add plenty of bi-carb soda, et voila, clean silver!!) Stains on kitchen counter tops, etc etc. Admittedly I’m trying to think when I use it as part of any cooking process, other than as a raising agent! The cream of tartar and baking soda are your baking powder without any nasty hidden suprises. 1tsp cot and 1/2tsp baking soda to 1 cup of flour. The baking soda is also the best cleaning agent around, is a fantastic stain remover and carpet deodorizer and a tablespoon added to the wash improves the performance of your washing detergent so much you should be able to use less of it. And best of all its cheap. cooked chickpeas freeze beautifully in any size that is good for you. Great post. I really need to cull my pantry. Here in Perth at one of the “Big 2” (so probably available at both) I buy packs of 4 x 125g tins of chickpeas – great to add to a salad for a quick lunch. Four bean mix is also available like that. Great post. I am with you on the list, almost the same as mine. Nothing more annoying than a cupboard full of just not enough of five different types of pasta to make a meal. Is the pantry in the photos yours? Now that is impressive! As I can be trusted with a short list of pantry essentials, my next chellenge to buy some decent containers and tidy everything up. Might also help me win the war against the dreaded Sydney pantry moth. Thanks for the inspiration. Bicarb and cream of tartar are definitely part of my minimalsit kitchen – I use them in baking, sweets and the tartaric acid to add acidity to jam/gingerbeer/cordial/sorbet if I have made some and the fruit was s smidgin too ripe. Both are pretty handy for cleaning too! They are part of my top 15. Ditch the baking powder – it is a single use item only! I agree with you on chickpeas. Love them. ALOT. You are hilarious. This list is great – my pantry looks like a supermarket exploded into it most days (though I have been making sure I go through it at least once a month and get rid of things I don’t use). I’d change vanilla extract to vanilla bean paste, I use all sorts of flour and sugars cause I cook almost everything from scratch, and my orange flower water is used in my orange salad (which is 10 mins, 4 ingredients) so do I get to keep it? Plus fattoush = pomegranate molasses so don’t give up on it yet!!! However I have never had dessicated coconut in my house and I intend to keep it that way – you crazy Australians with your lamingtons.. my kids beg me to make them but I will stand firm!! :-) And agree with chilli flakes – I put them in almost every recipe – not enough to taste exactly, but they lift the flavour of almost everything. I think I could live with your list – though probably would need another cheese than parmesan and some peanut butter. It is interesting that you are ditching some of your ‘ethinic’ ingredients – I find that trying different cuisines expands my range of pantry products that I don’t use often and also that I go through phases when I have ground almonds all the time and the suddenly don’t touch them for ages. Reading blogs always tempts me to try new ingredients though I try to substitute with what I have in my kitchen. I’ve thought often about what would be in my “survival” pantry, and I’ve posted about it several times, too. There’s some overlap with your list (salt, pepper, olive oil, vinegar, etc.) and also much that reflects individual preferences. For instance, I could live a lifetime without rosemary, but wouldn’t want to go a day without fresh thyme. Could live without chickpeas, but not without black beans. And I tossed the random orange and rose waters from my pantry, too! Yummmm. That chickpea dish looks divine! Excellent list, I’m always searching for the perfect ‘bare essentials’ storecupboard. Nigel Slater has a good one in Appetite. I was looking through food blogs after a light dinner, saw your chickpea salad, and knew that a second course was in order. My pantry overlaps with yours quite a bit, so I had the ingredients, and it really did just take 10 minutes (plus some time to stir fry fresh green beans in the leftover oil and spices). I think it’s going to be a new quick dinner favorite. Thank you for sharing! Great list. I can’t do without my Indian stuff: turmeric, garam masala, fennel seeds, cloves, cinnamon sticks, elaichi, cayenne pepper powder. you’re my favorite blogger ever. I wonder: How much is a “C”? I’m guessing it is a “cup”, but how much should your cup hold? I have different cups to choose from;-) Help me out? I’m with Jennifer: keep the bicarb and ditch the baking powder. It has so many more uses and bakes as well – truly a wonder-product. My top three are sticky toffee pudding, deodorising the fridge and polishing the outside of the kettle! Also I have to have a tin of kidney beans in the house. Refried beans are my go-to comfort food every time – everything in the store cupboard (beans, onions, garlic, spices), just add one or two fresh peppers and you’re there. Love your blog. I have been following it for months. I love this post because it is what I used to always search for online-what to have in my pantry (I was a new married and didn’t have much of a kitchen yet). In my blog I try to do similar posts (well, I will. I have only posted twice.) I am a NEW food blogger and I am not sure the protocol on these kinds of things, but I am going to add you to my blogroll because I read you everyday. Anyway, please let me know if you do not want me to place you on my blogroll. Thank you! thanks for sharing your pantry essentials everyone. I am now reconsidering the bicarb v’s baking powder – I’d forgotten about all the nifty non baking uses for bicarb. good luck with your blog – no need to ask to add people to your blog roll. yeah I’m rethinking the pommegranite molasses – I used to use it all the time – of course fattoush. yes it’s my pantry in the photo. I love my jars. thanks for the vegemite tips – my mum used it in cooking but I hadn’t thought to. love dried cherries in steel cut oatmeal and in oatmeal cookies — they plump up and give a wonderful sweetness so you can use less brown sugar or instead of raisins! Hi Jules, great post. Seems we have a big group of people here who could happily cook a great meal in each other’s kitchens! Here’s a question that’s been on my mind for a while, you might be a good person to ask. What is the best way to store parmesan? I use it often, but not often enough that i can use the whole block before it gets mouldy? Any tips on good storage? I’ve heard different theories about paper vs plastic wrap, and so on, but haven’t found a winner yet. Ooh yes and with your glucose syrup you could make some muesli bars. I tried a recipe the other day and failed completely, but it’s definitely a good way to use up a jar. Chick peas…Edgell makes it in a 125g size. Also in that size are corn kernels and creamed corn – essentials for my pantry. I’m loving this blog. Your old friend, Jane (we’re both ex-Arnotts) pointed me in your direction. Ciao. I love reading these pantry suggestions. Also, that picture has me wanting to go out and get some more of those jars and organize my pantry :) Its funny, for me dried black beans and canned chipotles in Adobo are absolute essentials! I cook with them every week, easily. Same with dried pinto and red beans. I cook up big batches and stick them in the freezer to use in recipes later. Jalapenos are a must for me as well, and onions – they both just add so much flavor to everything. I also see natural unsweetened cocoa as more essential than chocolate – I find I cook with it far more. For my baking pantry – bicarbonate of soda AND baking powder, flour, granulated sugar, confectioners sugar, brown sugar, and vanilla extract are all unfortunately essentials (gotta be able to make chocolate chip cookies in a pinch). If you need to get rid of the rose and orange blossom waters, a good non-cooking use is to put them in a spray bottle and douse liberally on your linens. I use about half fancy water to half plain water. It’s great to climb in bed and find amazing smells. i have been reading this site for just a few weeks, but was drawn to it because I could see an obvious challenge I could offer you. This December my husband and I will set sail from Melbourne to Cape York and return back home. We expect this passage to take a very leisurely year. It could be done much more quickly, but we are planning on a passage which will give us plently of time to slowly interact with all the communities we will encounter. Based on a 10.5m/ 35ft yacht, we have limited storage space for bulk foods, and limited but functional refrigeration. Please offer your idea’s for space/refridgeration saving food idea’s. Currently we have onboard the ability to use a stove top, oven and bbq all gas fired. We often use a small cryovac machine to store both cooked and raw foods. We eat all foods with great relish, so have fun with the challenge! I just made the chickpea salad, but with pinenuts, chopped kalamata olives, and freshly picked spinach :) Amazing! Cream of Tartar…works great to fend off an impending bladder infection. Just 1/2 to 1 tsp in 8 oz of water. Usually works within about 1/2 hour. Unfortunately tastes a bit like a Bayer aspirin that has dissolved before being swallowed. Love the site. I’m a vegan college student and I have definitely developed my minimalist kitchen on accident in the last few years. When one only has $30 and an hour for groceries each week, one gets creative. My roommate on the other-hand easily takes up twice as much room as I do in the pantry. It’s refreshing to hear from a kindred soul. can’t wait to read more. I have used baking soda far more than baking powder. Can someone make an arguement for baking powder please? I don’t get it. If I have garlic, olive oil, and pencils in the house, I feel okay. Throw in some dried pasta and vinegar and I’m a happy camper. completely. Wonderful list. I’m a creole girl from the southern reaches of Louisiana. We’re very French down there. Can’t do without onion. Definitely one of my absolutely essentials. I realize this is a bit late, but baking soda (bicarb soda) and plain white vinegar are fabulous for cleaning and disinfecting things from laundry to refridgerators, to getting burnt stuff off the bottoms of your pans. Thanks Jules, after finding this recipe, I think I make it for my husband and I once a week. It impresses guests and curbs our snack cravings…instead of chili flakes, I use Sriracha (lots) – we like spicy…anyway, thanks! Bon Appétit from Nice, France! What do you think of the flavor of Bragg’s Liquid Aminos vs. traditional soy sauce? Would it be an okay substitute in your opinion? Thanks for the great list! About the dried organic cherries, I love to add these in oatmeal or any other hot breakfast cereal. Add them in while your cooking the oatmeal so the cherries rehydrate and plumpen up. (you can do this in the microwave, stove top, or however you cook your oats) It adds so much more favor, texture, and a little bit of sweetness. Fabulous Pantry……a little like mine! I have been growing in health awareness, and I have become rather fokd of superfoods. What I am not fond of is the price…so I have been smart about it…juggling superfoods with whole foods..balancing meals and portions… and keeping the budget inline! I’m sure your site will be of great benefit to me..
And for diabetics, you can now use Stevia as a sweetener. Natvia brand has some good work-arounds to make this work as well as sugar. 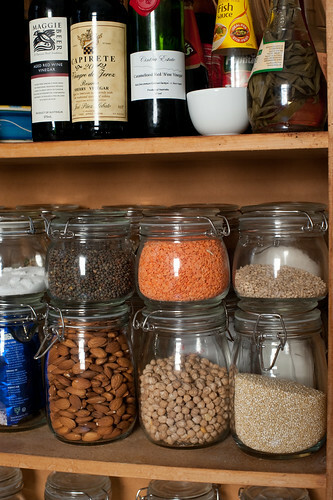 Random question – can you tell me where you got the canisters you use in your pantry? Our pantry is completely exposed, so I wanted to store all my ingredients in cute jars but have been having a hard time finding cute ones that also store food well. They’re just from Ikea Jennie… a good investment! Jules – you could always put those dried cherries into muffins if you are anxious to use them up. I often use dried cranberries, but cherries would work just as well. I know this is an exceptionally tardy reply, but the best way to use up caperberries in to pop them atop a Bloody Mary or in a vodka martini! As a college student with a college-student budget, let me just say how much I love you. My one disagreement with this list is red wine vinegar – I make my own salad dressing (I got it from my dad, the Greek one) of olive oil, red wine vinegar, oregano, garlic powder, and sometimes a little lemon juice, and I’m not willing to give that up. But of course, that’s just me. I have cream of tartar for making playdough, I don’t know if I have ever used it in food. Great Nicole! So glad we’ve got you trying puy lentils… They’re delish! Now that I’m looking at my pantry, I’ve got a heap of hazelnut meal that I can’t even remember why I bought it (as in, which recipe I intended to make). Do you think it would be ok to substitute into recipes calling for almond meal, or would the flavour be stronger and make it less suitable? Hazelnut meal is lovely in baking but it can be quite strong on flavour so if you think you might not want too much hazelnut flavour just use half/half with almond meal… although it goes really well with anything chocolate!